Roughly translated as "Ireland Forever", the phrase "Erin go Bragh" is a common phrase used to express allegiance to Ireland. Saira is definitely not Irish and Jen is not quite sure what she is, but lucky for us, in the U.S. you don't need to be Irish to celebrate St. Patrick's Day. St. Patty's Day is known for many things from leprechauns and rainbows to drinking Guinness and eating cabbage. But, for most of us it is simply associated with the color green and the lush rolling hills of the "Emerald Isle:". Planning a springtime wedding or event? 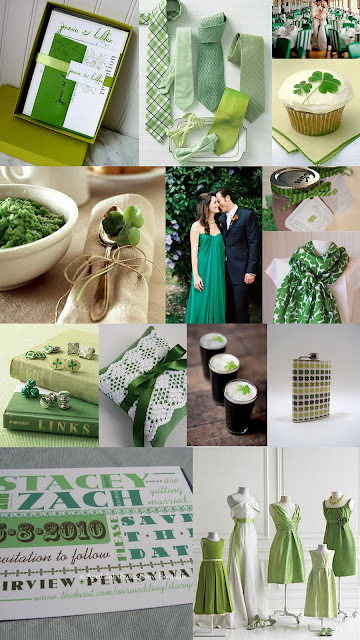 Embrace the luck of the Irish with this inspiration board featuring shades of green and joyful clovers.